Saskatchewan is joining other provinces in Canada and has announced movement towards an immigration system based on Expression of Interest. From July 16th, the province will operate two International Skilled Worker streams through the use of EOI. It is significant that candidates will present the profile to the SINP and also enter an EOI pool. They will receive the ITA for Saskatchewan immigration through these streams. 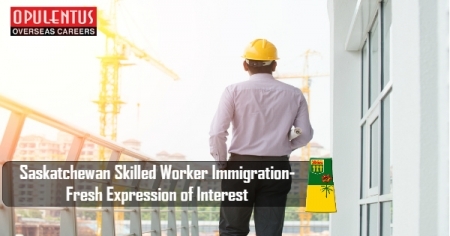 An immigration statement of Saskatchewan says that the Candidates who are suitable in meeting the demands of its immigration objectives and labor market will be chosen from the International Skilled Worker EOI system. The attributes they seek are language proficiency, provincial connectivity , and work experience. The profiles of Candidate will hold validity for one year from the date of submission. Candidates must send only one profile at one time. The ranking will be based on the information given. Those who have a high rank will receive the invitation for submitting a complete application through regular draws. The entire communication with the candidate will happen through email. They must ensure that their profile is accurate. In case there is a change in the circumstances of the candidate, they need to update their profile. Saskatchewan will not accept Profiles based on false/omitted information. Invitations to Apply issued through regular draws. They need to submit completed application in 60 days. Officials will make an assessment of applications to take a decision. A Score of 60 out of 100 on the point assessment grid of SINP. Post-secondary education, apprenticeship/training comparable to the education system in Canada of one year, and earning a diploma/ degree /certificate. One-year work experience in the last 10 years in an occupation as per the official list. Evidence of qualification license in Saskatchewan if there is a requirement in the field. Evidence of funds and a settlement plan. Candidates based outside Canada, or having a legal status in Canada, qualify for this category. They must not a refugee claimant. Present a profile in the EE Pool and also a job seeker validation code. Get 60 points out of 100 on the SINP grid. Provide applicable results of a language test from a testing agency having an official status. The results need to match with declaration in EE profile. Work experience of one year in Canada in the last three years (trades and non-trades). Possess work experience in a high skilled occupation in the NOC 0, A or B having a demand in Saskatchewan. Proof of eligibility for a license issued by Saskatchewan, having a a skilled trade or a regulated profession. For all skilled trades, a certificate from the Saskatchewan Apprenticeship and Trade Certification Commission is compulsory. Proof of funds and a settlement plan.